The Tamiya TS58 Light Pearl Blue is a synthetic lacquer which can be used to paint plastic model k.. The Tamiya TS59 Light Pearl Red is a synthetic lacquer which can be used to paint plastic model ki.. The Tamiya TS6 Matt Black is a synthetic lacquer which can be used to paint plastic model kits. .. The Tamiya TS60 Pearl Green is a synthetic lacquer which can be used to paint plastic model kits. .. The Tamiya TS61Nato Green is a synthetic lacquer which can be used to paint plastic model kits. .. The Tamiya TS62 NATO Brown is a synthetic lacquer which can be used to paint plastic model kits. .. The Tamiya TS64 Dark Mica Blue is a synthetic lacquer which can be used to paint plastic model kit.. The Tamiya TS67 IJN Gray Sasebo Arsenal is a synthetic lacquer which can be used to paint plastic .. The Tamiya TS68 Wood Deck is a synthetic lacquer which can be used to paint plastic model kits. .. The Tamiya TS69 Linoleum Deck Brown is a synthetic lacquer which can be used to paint plastic mode.. The Tamiya TS7 Racing White is a synthetic lacquer which can be used to paint plastic model kits. .. The Tamiya TS70 JGSDF Olive Drab is a synthetic lacquer which can be used to paint plastic model k.. 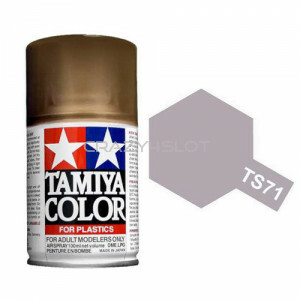 The Tamiya TS71 Smoke is a synthetic lacquer which can be used to paint plastic model kits. Each.. The Tamiya TS72 Clear Blue is a synthetic lacquer which can be used to paint plastic model kits. .. The Tamiya TS74 Clear Red is a synthetic lacquer which can be used to paint plastic model kits. .. The Tamiya TS75 Champagne Gold is a synthetic lacquer which can be used to paint plastic model ki.. The Tamiya TS76 Mica Silver is a synthetic lacquer which can be used to paint plastic model kits. .. The Tamiya TS78 Field Gray is a synthetic lacquer which can be used to paint plastic model kits. ..